One year has passed since I started writing posts on Living in Rural Mallorca. I know this because WordPress just told me. And yet it seems just a few months ago that I started my new blog, after we’d finally had an Internet service connected to our finca on the island. This also means that we’ve had our Broadband Wi-Fi connection for a year, so thanks very much Wi-Fi Baleares – who achieved what we were convinced no company ever would, and stopped me pulling all of my hair out in frustration at a local Internet café. Yes, time seems to pass quickly on Mallorca . . . except when you’re waiting for your tree’s first lemon to ripen. I wrote about our young lemon tree in June 2012 – The Boss having planted it in the spring of that year. We were looking forward to plucking a plump yellow lemon and slicing it into a celebratory G&T. Christmas seemed a likely date for this epic moment, but Christmas came and the first of our crop still looked more like a lime than a lemon. Easter perhaps? Naah. 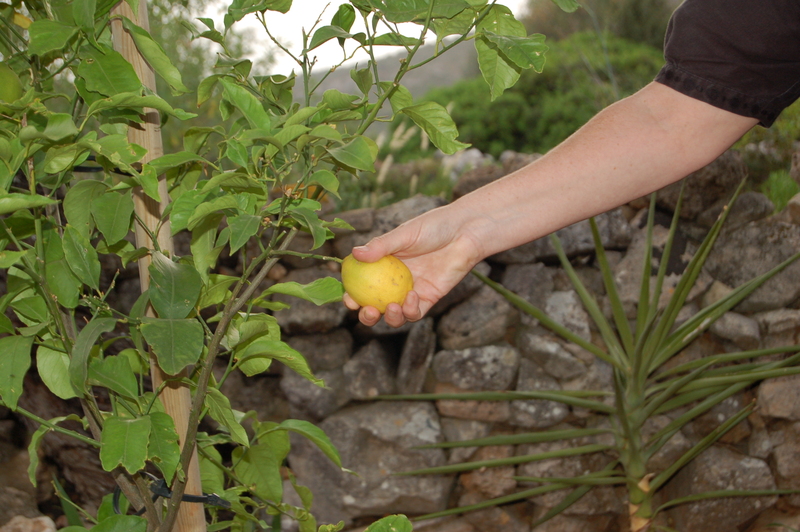 But last week the moment to pick the first lemon from our garden arrived. And we were lucky enough to have our great friends from Oxfordshire with us to share in our minor triumph (a suitable distraction from the slow progress of the blackthorn shrubs they’d brought us on their previous visit). Our luscious and deliciously fragrant lemon was sliced into four glasses of The Boss’s famous G&Ts, made with Mallorcan Can Vidalet gin. Delicious. By my reckoning, the next lemon should be ready in about seven months’ time . . . I know whereof you speak! But….you have a Mediterranean climate so what takes so long? Just kidding, I know that the first thing a gardener has to have is PATIENCE. My hubby planted a (supposedly) cold hardy cherry tree last autumn. We did not expect any thing to happen for maybe 7 years, like with apple trees. But….what a surprise! There are actually tiny green cherries on it. I don’t know if they will every ripen, though. I just have to wait and see. Congratulations on your FIRST lemon. It must have been very exciting and gratifying. I cannot even imagine the luxury of citrus fruit in one’s own garden. I do get very excited about growing things we can eat, and wish we had a better quality soil – as well as the Med climate. We get very little rain in this part of the island in summer and have to be careful regarding watering, as water is an expensive commodity. If only the well wasn’t ancient and didn’t require an expensive repair before we could use it! It’s also precariously located and basically just a hole in the ground, so potentially dangerous . . .
Good luck with the cherries – it’s cherry season here and we eat as many as we can while they’re available and affordable. Love the photos, by the way! Thanks for sharing. Did someone mention blackthorn shrubs?!?! Actually, I think those blackthorns have grown a few centimetres since you were here! The Boss makes a great G&T – and the Mallorcan Can Vidalet gin is something very special . . .